One of the things that clearly sets us apart from the rest is our people. Our region managers have a depth of experience. They are local. They are licensed and certified. And, they are here for you. To learn more about these professionals, see our website and reach out. They will gladly tell you more about all we do for our valued customers. 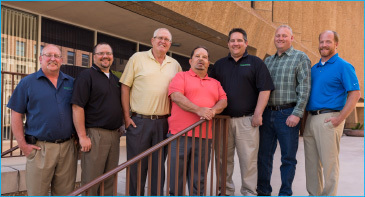 PeopleService Region Managers (l to r): Herb Krueger, Greg Stang, Duane Grashorn, Dennis White, Steve Robinette, Paul Christensen and Steve Guthrie.